KCI is an Isuzu East Africa Limited appointed dealer for all Isuzu vehicles and body-building with the ability to supply Chassis and Body under one roof. KCI supplies Isuzu vehicles and builds all types of bodies which are scientifically designed in an in-house Computer Aided Design (CAD) facility. 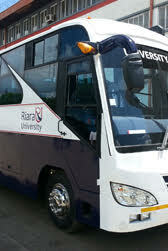 KCI bodies are very attractive, comparable to imported-quality buses, with an added advantage of strength and flexibility which is essential for local road conditions that translates into savings on fuel, tyres and savings.